PanelScan is a user-friendly and easily integrated traceability solution for capturing barcode data from multi-array PCBs at the front-end or mid- stream on any SMT line. 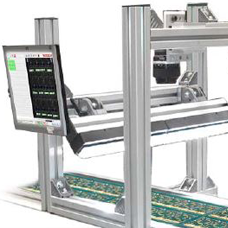 This integrated system replaces error-prone manual scanning with a solution that allows for in-motion reading and keeps production lines moving. The PanelScan system is the ideal traceability and inspection solution for any high mix, low volume electronics manufacturer. For more information feel free to contact our product specialists who will be happy to help you with your application or for more information you can visit the website directly MICROSCAN.